While I was in Denmark earlier this month I ended up watching the morning magazine programme on the equivalent to ITV. One of the lead stories that day was on how to bake the world’s best bread. I am quite fussy when it comes to bread; one could describe me as a bread geek. Earlier this year I got back in to baking my own bread. As a student living in England, buying what I consider the best bread can be both costly and time-consuming. The typical English bread bin contains a pre-sliced, very chewy (and generally white) loaf. While I can put up with this when it is toasted, or when something with a strong flavour and enough texture to hide the bread’s awful chewy-fluffy-tastelessness is applied, I generally avoid this type of bread. The wholemeal alternatives, produced in the same way, are slightly better (there is some flavour, but the texture is the same) but the only real positive side to this style of bread is the extreme longevity (i.e. it takes forever to turn stale). What is it that I look for in a bread? This is probably not a question most people take time to consider in their daily lives. The first issue to consider is the flour - wholemeal or white. White is (for me) something to save for special occasions, rather than a day-to-day bread for lunch or accompanying a meal. My general bread recipe uses a blend of wholemeal and white flour which produces a good texture; I find pure wholemeal bread can be a bit too dense. The next factor in bread quality is the texture. I have already explained my dislike of the sliced English bread, which primarily stems from the texture. What I look for is a spring in the loaf which is countered by a satisfying crunch in the crust. Chewy can be fine, if the bread springs back and does not stay squashed - as is the case with most sliced supermarket loaves. I am not a great fan of bread which turns to crumbs the moment a bread knife gets within a centimetre. A third quality of bread which I consider is the taste. I don’t like my standard loaves to have a very strong flavour like Rye or sourdough variants, but conversely a tasteless bread is a little disappointing. I can remember supermarket “French” bread sticks having a bit more flavour than they do nowadays, but generally the Italian style loaves have a nice flavour. You might by now be wondering what the recipe I use for day-to-day bread is. I must admit, I don’t like spending large amounts of time kneading. Therefore I often use a bread machine to do the mixing and then finish rising and baking in a separate tin (this gives a far better taste, crust and shape than the machine’s low temperature baking). One recipe I tried and hold in high regard is one from the Guardian by Felicity Cloake: http://www.guardian.co.uk/lifeandstyle/wordofmouth/2010/jun/10/how-to-bake-wholemeal-bread. This method requires repeated kneading for short periods, but creates a really good loaf. The standard loaf I make is similar, using sunflower oil instead of butter, and I vary between using molasses sugar and plain white sugar. I don’t normally add the vitamin C tablet, but it does create a slightly more open texture with wholemeal flour. Today I baked the “World’s Best Bread” for the first time. I say today, but the process began last night with the initial assembly of ingredients for the twelve hour resting period. This morning the dough was full of air bubbles and had grown considerably in size. The next phase of rising involved dusting the folded dough with flour and a little textural supplement (in my case poppy seeds) and placing it on a tea towel for a further hour or two. As I was slightly time constrained I limited the time to an hour, but the dough had risen substantially enough in that time and did not spring back after poking. In the mean time I took the phenolic handle off my big Le Creuset (see this post) and preheated it to the maximum oven temperature. What came out of the oven smelled great, but then I am accustomed to that hunger-inducing scent from past baking efforts. The loaf produced a satisfying hollow noise when tapped and had a bit of give. This reassured me that the loaf would not be horribly dense. When I placed the dough in the hot pan, I did not take time to even it out in the base, and to my surprise it did not fill the width of the pan. Next time I may try to produce a perfectly round loaf, but I quite like the rustic shape of this first try. 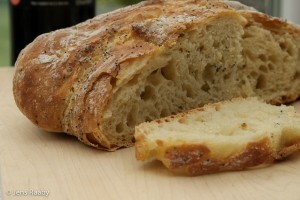 The texture revealed when making the first slice was much lighter than my usual loaves. Large air pockets feature throughout, but the overall bite ‘gives’ just the right amount. 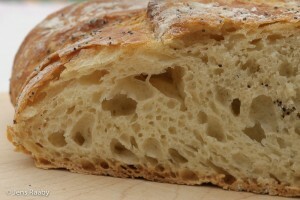 It reminds me of the texture of a good ciabatta. The crust nicely browned for the final 15 minutes in the oven and has a good crunch, better than my usual attempts. The flavour is certainly good. With such a simple recipe there is not much to alter the pure wheat taste. This loaf has a really nice taste of… wheat. It reminds me of how rye bread has a powerful sour scent and the flour provides the main taste. I have already mentioned that my preference is for a wholemeal/white blend but that will wait until the next time. This white loaf is slightly darker in colour than I am used to (do they bleach the supermarket loaves?) but tasted great with cheese, homemade apple chutney and apple butter. Would I recommend you try this recipe? It is certainly worth the effort to bake it at least once. I used a cast iron saucepan but if you don’t have one (yet) then it should work in a lidded Pyrex dish or a stainless steel oven-safe saucepan, but not necessarily as well. My main criticism is that it takes a bit of forward planning. The best timing is dependant on your work schedule. The initial preparation takes 5 minutes, but then you need to wait 12-18 hours before rising and baking. I started in the evening around 10pm and the loaf was out of the oven at 12.15pm the next day, and that was hurrying things slightly. Clearly if I was working away from home during the day this would not be such a good schedule, and I would probably have to do the baking the next evening. For my day to day “sandwich” bread I will probably stick to my wholemeal/white blend with sugar and oil, but if a trial run of this recipe with wholemeal flour added works well I could end up converting. In case you missed it, here is the link to the recipe once more. Edit: I’ve now tried the wholemeal variant which turned out really well, although I added a little brown sugar and adjusted the water/flour content. The resulting bread had a very good texture, and is definitely an improvement over my earlier 50/50 white/wholemeal attempt.